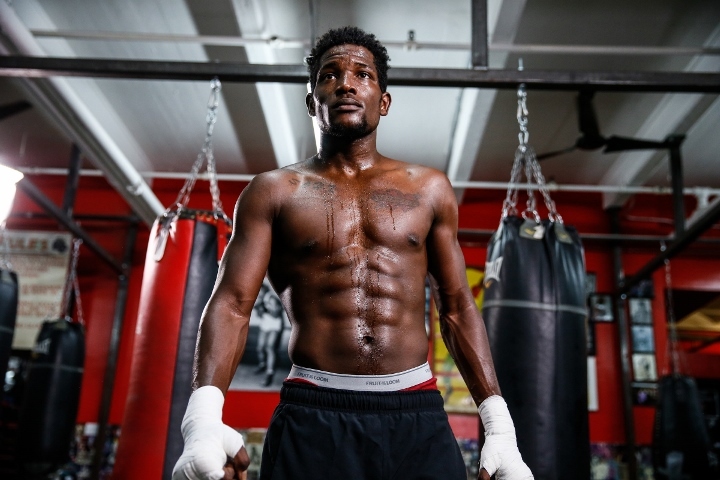 NEW YORK – When it came time for Erickson Lubin and Jermell Charlo to talk Thursday, there was a lot of background noise. Members of their teams argued about who’ll win their fight Saturday night, threatened each other and didn’t stop until promoter Lou DiBella warned that they’d be removed from a press conference at Highline Ballroom if they didn’t cut it out. As usual, Lubin remained calm and didn’t let those distractions affect his focus. The only noises coming from that side of the room that resonated with Lubin were the comparatively peaceful noises made by his newborn son, 3-month-old Malachi Lubin. The powerful southpaw’s strong desire to become a world champion by knocking off Charlo is as much about making Malachi Lubin’s life better as anything. “This is something I dreamed of since I started boxing, and I knew how to box before I knew how to read,” Lubin told BoxingScene.com. “This is definitely something that kept me out of trouble, kept me in the right position. I’ve got a great team behind me and I’ve just been working for this my whole life. Mature beyond his 22 years, Lubin understands just how much is at stake Saturday night at Barclays Center in Brooklyn. Beating Houston’s Charlo (29-0, 14 KOs), the WBC super welterweight champion, in the second of three fights Showtime will televise would lift Lubin (18-0, 13 KOs) into a higher tax bracket and elevate him to another level as one of the youngest world champions in the sport. Making more money obviously is important, but a thankful Lubin also wants to make his trainer proud by accomplishing something in which they’ve invested so much together. The bond between Jason Galarza, who has worked with Lubin since he was 13, and the precocious contender extends well beyond boxing and has been instrumental in Lubin becoming one of the best 154-pound fighters in the world. “He has definitely helped me as a person by teaching me how to be a leader,” Lubin said. “He’s a leader himself and I definitely look up to him. He has taken me in since I was 13 years old. Even when I didn’t have it, he’s been that guy to step up and made sure I got what I wanted when it came to shoes and all the stuff that I couldn’t afford. Their relationship has helped keep Lubin focused and out of trouble while growing up in the violence-ravaged Pine Hills section of Orlando, Florida. One of seven children, Lubin began boxing at just 4 years old. He first went to an Orlando gym with his older brother, Michael Louis, who went 10-1 (9 KOs) as a professional welterweight from 2008-09. Galarza knew early in their relationship that Lubin would develop into something special. Whenever anyone tells Galarza it’s not yet “Hammer Time,” that Lubin is too young and too inexperienced to thrive at the elite level, Galarza reminds them of what he has witnessed throughout Lubin’s development. “I would respect that if he was an average 21-year-old or 22-year-old, but he’s not,” Galarza said. “He’s so calm that when people see him in the ring, they think he’s older than what he actually is. Charlo doesn’t believe Lubin is ready for this step up in competition. The 27-year-old champion has questioned Lubin’s legitimacy as his mandatory challenger, a position Lubin solidified by knocking out Mexico’s Jorge Cota (25-2, 22 KOs) in the fourth round March 4 at Barclays Center. Lubin likewise considers Charlo an unproven champion, someone who wouldn’t have taken this fight if not forced into it by the WBC. [QUOTE=Mayweatherducks;18134162]Fluck those Lion Cub Charla Sisters. War Hammer Lubin. KO that prick arrogant askhole. [/QUOTE]Say's a soft....sofa-surfing..... weakling. Lubin's best opponent is Jorge Corta. Corta's resume is embarrassing even for a club fighter. Fluck those Lion Cub Charla Sisters. War Hammer Lubin. KO that prick arrogant askhole. We got a fight! Lions only!